Collect and rub leaves with oil pastels to create a fun nature scene. Pair this craft with Earth Day or after a nature walk. Carefully unwrap the oil pastels you will use for this project. 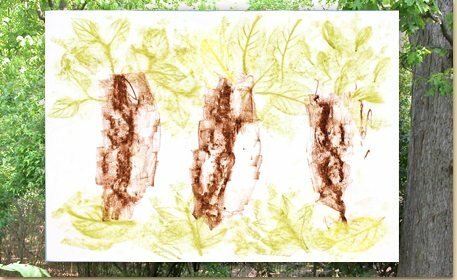 Since we created a rubbing of leaves and tree bark we chose to work with natural colors, like brown and green. The darker green will work best for this project.Tip: It’s okay if the pastels break, you will still be able to use the smaller pieces. Observe the leaves and tree bark you collected. Notice how the leaves are different shapes and sizes depending on what trees or plants they came from. Lay a piece of bark on the table and place the paper on top. While holding the paper and tree bark with one hand, gently rub a brown oil pastel over the tree bark. You will see the texture of the tree bark appear on your paper. Tip: Use the side of the unwrapped pastel for the best results. Lift the paper and move the tree bark to another part of the paper and repeat the rubbing. You can repeat a third time, so that you have 3 tree trunks on your paper. To add leaves to one of the tree trunks, place a leaf on the table and lay your paper on top. Gently rub the leaf with the side of the green oil pastel. You will see the veins of the leaf appear in the rubbing. Lift the paper and move the leaf to create additional rubbings. Repeat Step 6 with the other 2 tree trunks, using a different type of leaf for each trunk. Examine the texture each leaf type creates. To finish your piece, rub some leaves along the bottom of the paper to create the feel of grass. Once finished make different nature rubbings with other found objects from the natural world!